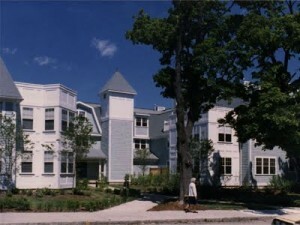 Eighteen residential units set into an existing Victorian neighborhood of Boston were designed and won approval from powerful local neighborhood groups by using traditional detailing and developing a plan that matches the scale, rhythm, and texture of the surrounding homes. The design provides a central elevator lobby with a pedestrian entrance court from the street as well as a formal entry convenient to the parking area. The plan also allows most of the residential units to have three exterior walls maximizing natural light and ventilation. A new landscape plan was developed to incorporate many of the stately existing trees and created privacy for the private outdoor patios and decks. The resulting complex sits gracefully at ease with its older neighbors, while providing comfortable and pleasant homes for its residents.